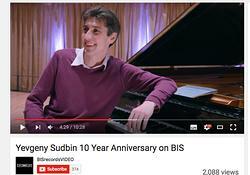 Since then, Sudbin and BIS has enjoyed a highly successful collaboration, resulting in numerous acclaimed recordings of both solo programmes and concertos. Thinking about the best way of celebrating the past 10 years, a new Scarlatti recording seemed the obvious choice for the perfect anniversary present – to ourselves, and of course to all Sudbin fans and Scarlatti lovers. Said and done: Sudbin met up with Marion Schwebel, the recording producer with whom he has collaborated from the very beginning, for recording sessions in the silken acoustics of St George’s in Bristol. The present video clip, produced by Jens Braun of Take5 Music Production, includes scenes from these sessions, but also comments from both performer and producer about the music itself, the recording process and the collaborative aspects behind it. The clip ends with a full-scale return to 2005, as Sudbin performs an extract from the luminous Sonata in F minor, K 466, which was included on the disc that set it all in motion. The new offering from Sudbin, Scarlatti - 18 Sonatas (BIS-2138), will be available starting March 2016.